Øyafestivalen is the summer highlight for many Osloites. Situated in Tøyenparken, Øya is Norway’s largest music festival that stretches over four days. Every year, you can experience a great mix of indie music, up-and-coming artists, and big headliners. 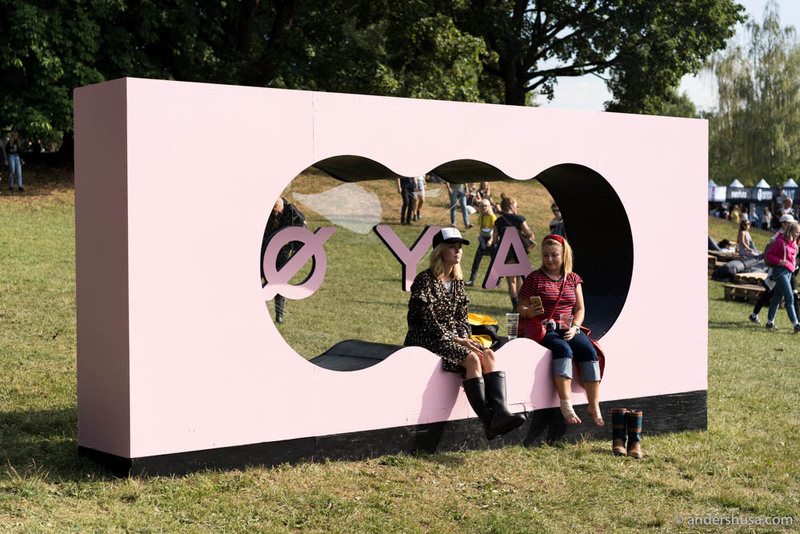 In addition to being a music festival, Øyas is also about environmental responsibility and a celebration of organic food. In cooperation with the green organization Natur & Ungdom, close to 75% of all waste is recycled. Volunteers open all garbage bags and sort the content by hand into 15 different factions (wood, paper, plastic, organic etc.). Restaurants are carefully selected each year, both for their food quality, but also for their ability to use organic produce. 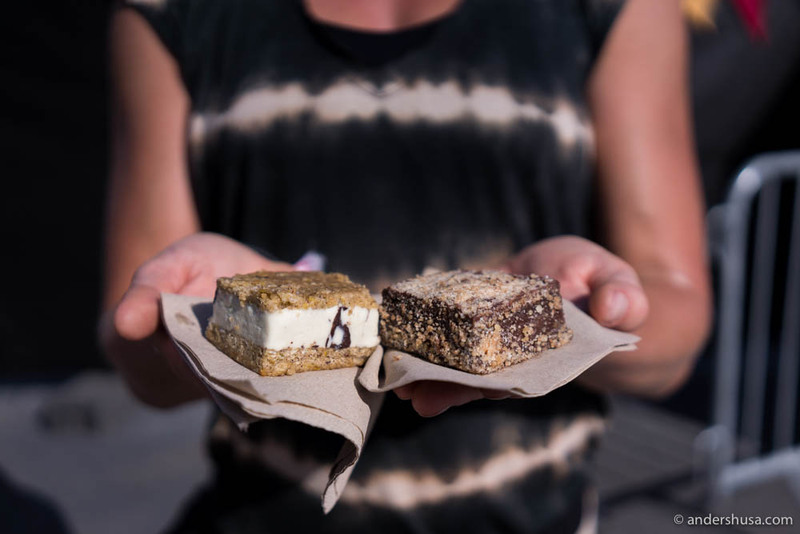 Last year, more than 95% of all ingredients used at Øyafestivalen were certified organic. That includes coffee, beer, and wine, by the way. 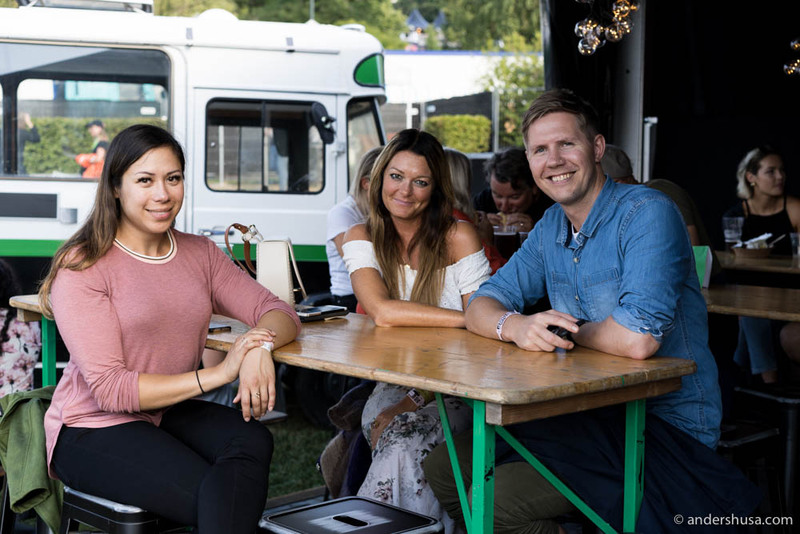 I highlighted my favorite dishes at Øyafestivalen in both 2015 and 2016. This year, I’m back at Øya as an official partner. This means, I have tested the food from all suppliers and reviewed each food stall. I brought in Marianne, Monica, and Aleksander to help me. One crossfitter, one amateur chef (who was recruited through my newsletter – sign up for special offers! ), one professional chef, and one food blogger. Four foodies. Together, we made up the Øya jury. Life is too short to waste it on bad non-organic food. 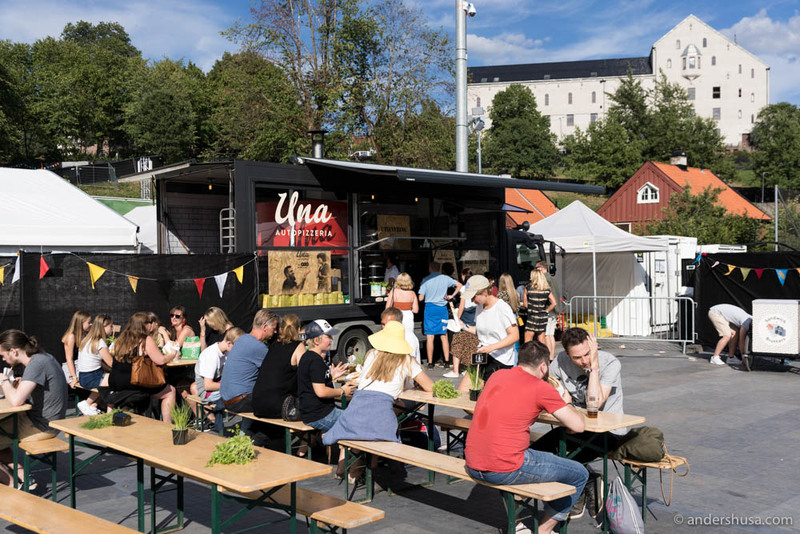 These are the best dishes at Øyafestivalen 2018, sorted from top to bottom. Classic fish’n’chips with remoulade – NOK 130. 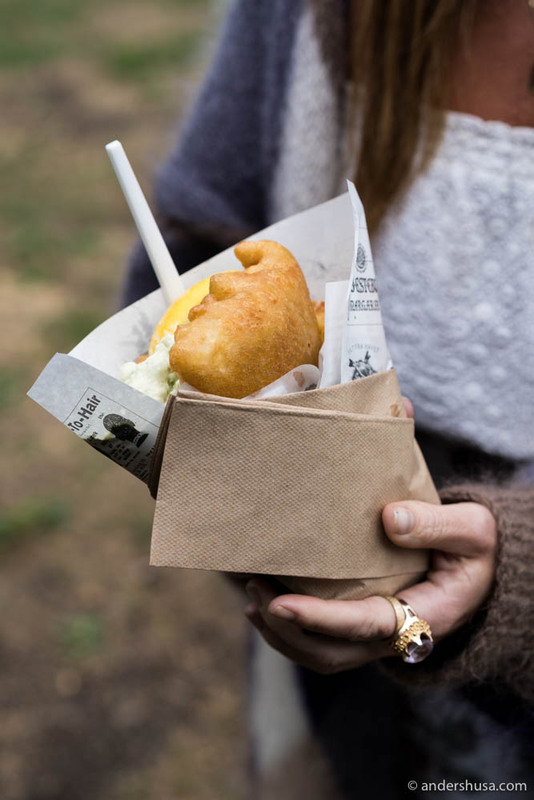 Fiskeriet at Youngstorget knows how to make fish’n’chips, and luckily, they also know how to make it festival-friendly. Presented in a smart cone-shaped newspaper, is a batter-fried cod, crispy on the outside and soft and flaky on the inside, with delicious, crunchy french fries and a homemade remoulade. Each element is just right and the dish is big enough to leave you satisfied for at least a few hours. At NOK 130, this is simply the best buy at Øyafestivalen in 2018. 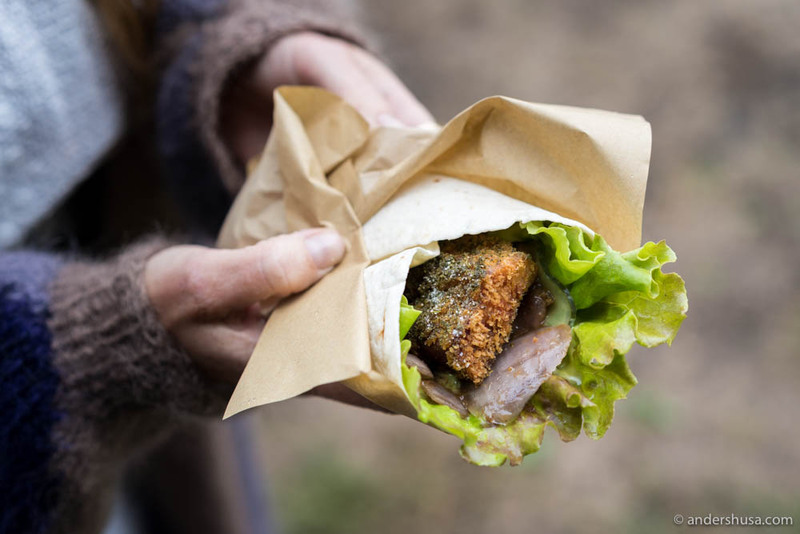 Schnitzel in a wrap with spruce, chili-cucumber & ramson mayo – NOK 115. 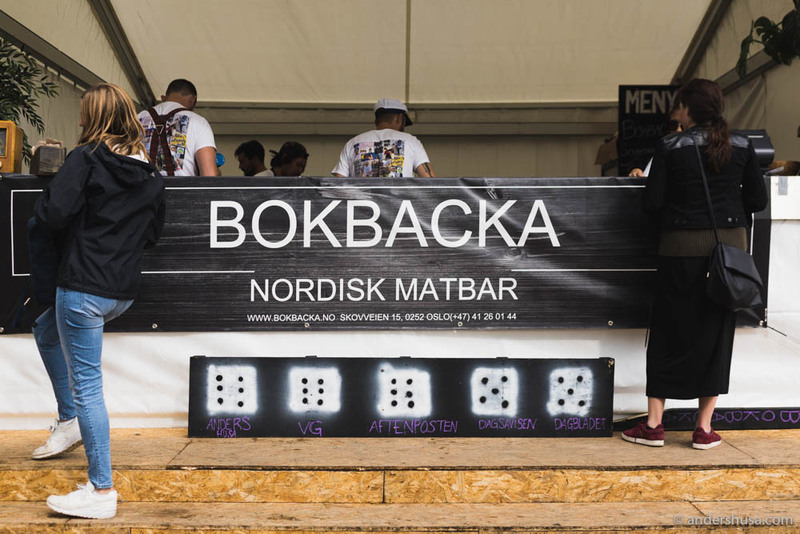 Bokbacka delivers one of the best dishes at this year’s Øyafestivalen. Their schnitzel in a wrap stayed warm and crispy, even after some time. 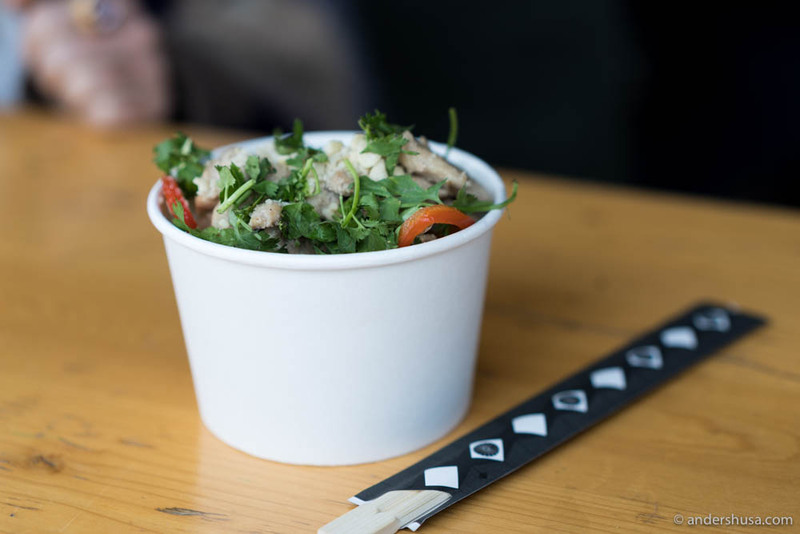 The presentation is smart and very festival-friendly, with lettuce inside a wrap that keeps all the juices in place. Great flavors and a well-balanced with the pickled onions and cucumbers. It could have been bigger, but then it only costs NOK 115. Bokbacka got great scores from most publications. Foodie Stories by Anders Husa was the first! 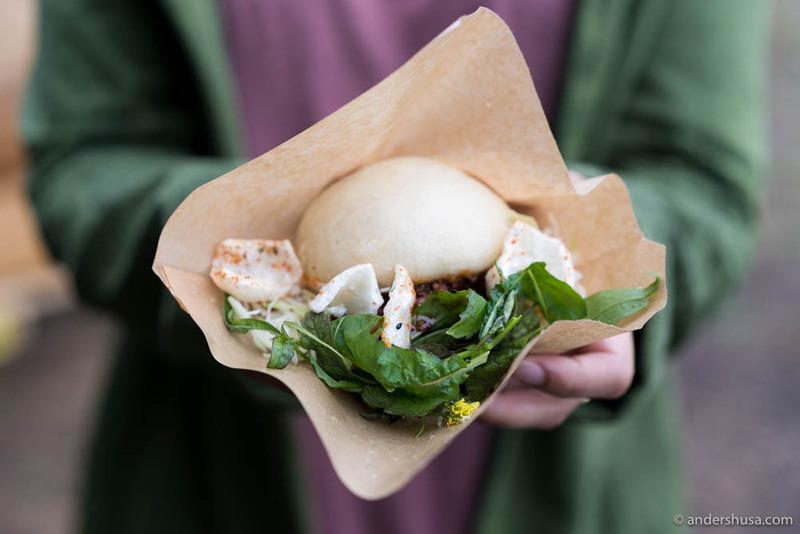 Szechuan chicken in a bun with funky slaw, kickass BBQ sauce, and fresh coriander – NOK 120. 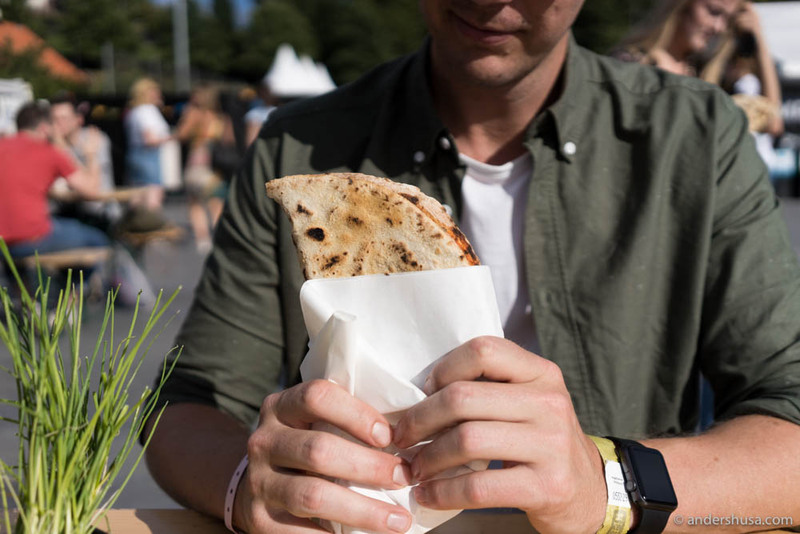 Smalhans has always been a solid provider of good festival food to Øyafestivalen. That’s true for this year as well. A delicious bun, filled with a whole, deboned, Szechuan chicken leg, a well-seasoned coleslaw, and a tasty BBQ sauce. 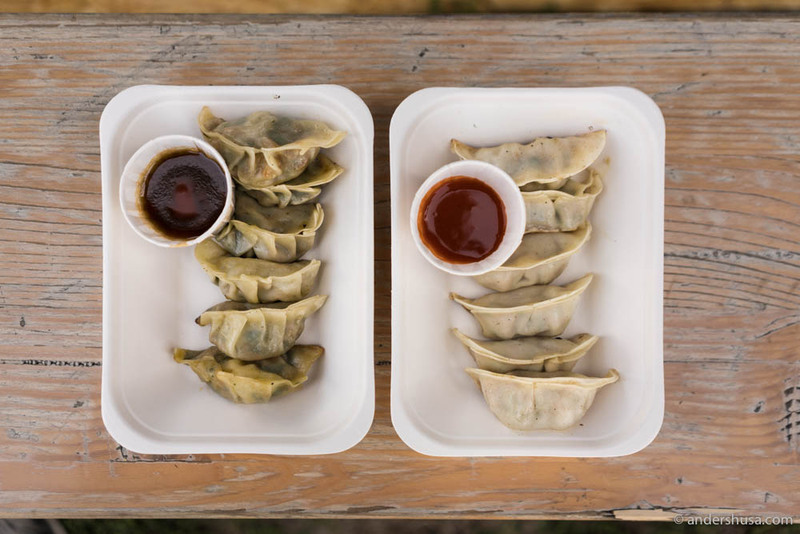 The fact that it’s a bit difficult to eat at a festival, is one of the few things that prevents a top score. We also would have preferred no skin on the chicken leg, since it’s not crispy. All cheese toast – NOK 120. What’s not to like with a good toast? 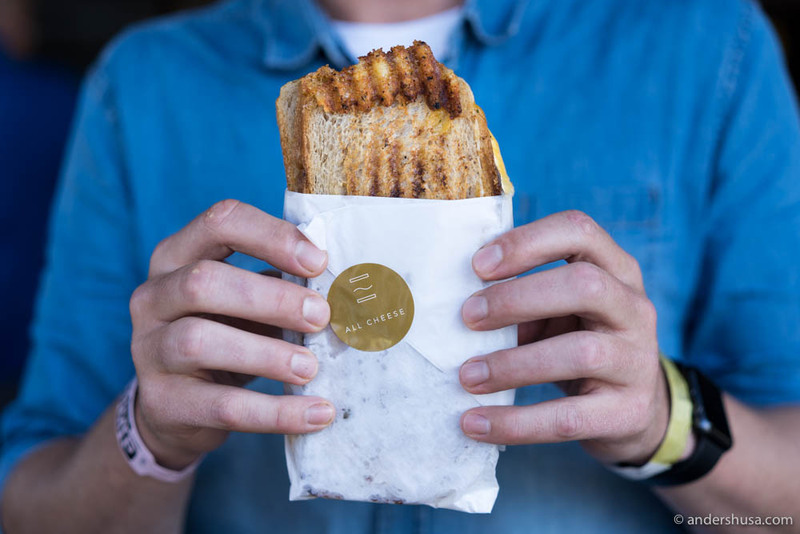 Melt’s grilled cheese is made with quality bread, tasty cheese, and lots of browned butter and garlic. The bread is crispy and the cheese is gooey and warm. It’s hard to hit that top score with just cheese, though. Perhaps try the lasagna version instead, if you’re not a vegetarian? 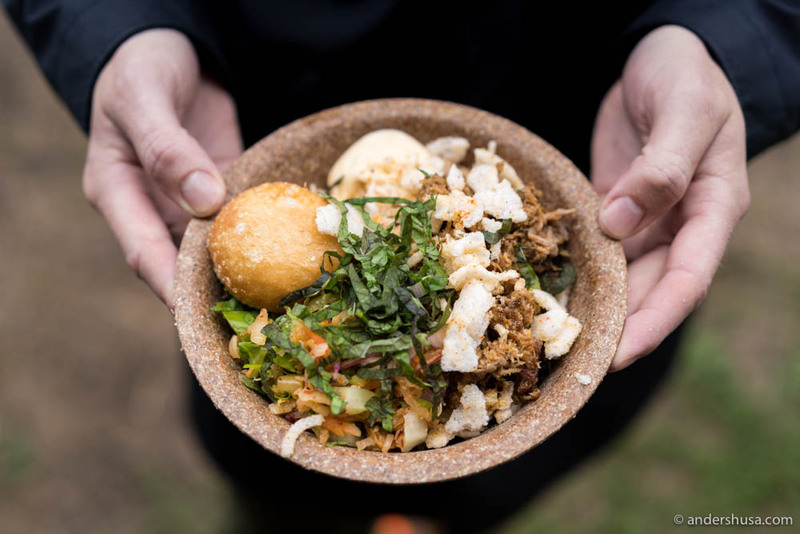 Sticky soy-glazed pork, kimchi salad, hitch crunch & crispy bao bun – NOK 120. 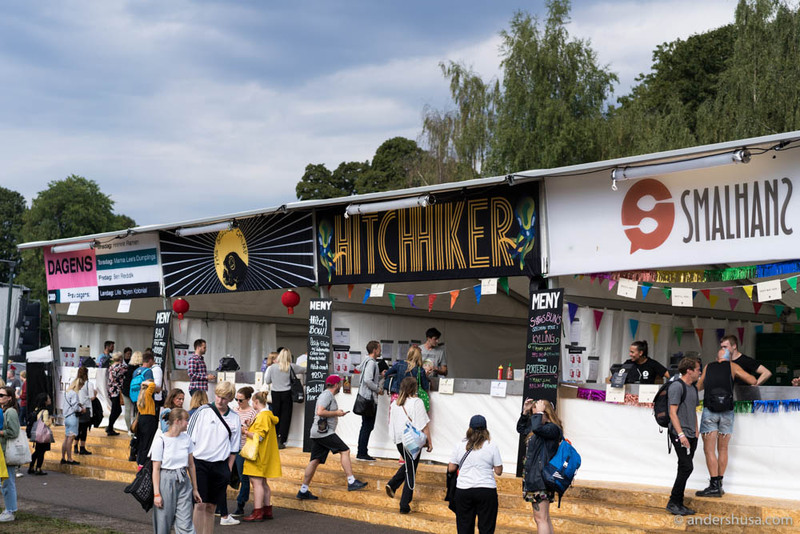 Hitchhiker has had some kickass dishes at Øyafestivalen previously, which left our expectations sky high. This year, they still have a great festival platter, but not quite at the 2015 and 2016 level. Juicy pork meat is seasoned well, the spice level is just right, and the crispy bao bun is great. However, whether it was due to bad luck or poor cooking, the rice underneath was not done. More importantly, it is the lack of that extra oumph from previous years, that decides the final score. We tried the Classic (cookie dough biscuit & vanilla ice cream), PistachiYo (pistachio and oat biscuit & pistachio and chocolate ice cream), and All Black Errrthing (chocolate cookie & chocolate ice cream) and the two first were the clear favorites. Somewhat steep price for the small size, but big plus that the ice cream and sandwich sticks together through every single bite. Brothless ramen noodles with spicy lamb, spring onions, & pickled sunchokes – NOK 120. Osloites are excited about the new ramen place, Hrímnir Ramen, that opens this October. The Japanese noodle soup has been popping up all over town lately. Also so at Øyafestivalen this Wednesday, but this time without the soup! Brothless ramen can be delicious, but it’s a tough dish to balance. Something was off with the version this day, that was so great at Kokkenes Dag just a few months back. It was creamy and spicy, but we were missing some acidity, and also felt the lamb meat had more potential than the current version. Not a top score today, but we have a feeling they will come back stronger. Bao with pork, cabbage & XO sauce – NOK 95. So much potential in this one! Yet so far from a decent festival dish. The bao is delectable, but the current presentation just doesn’t work. Sauce was already dripping out when we arrived at our table, which is a shame because it’s very tasty. You basically have to eat the bun with your hands and the rest with a fork. 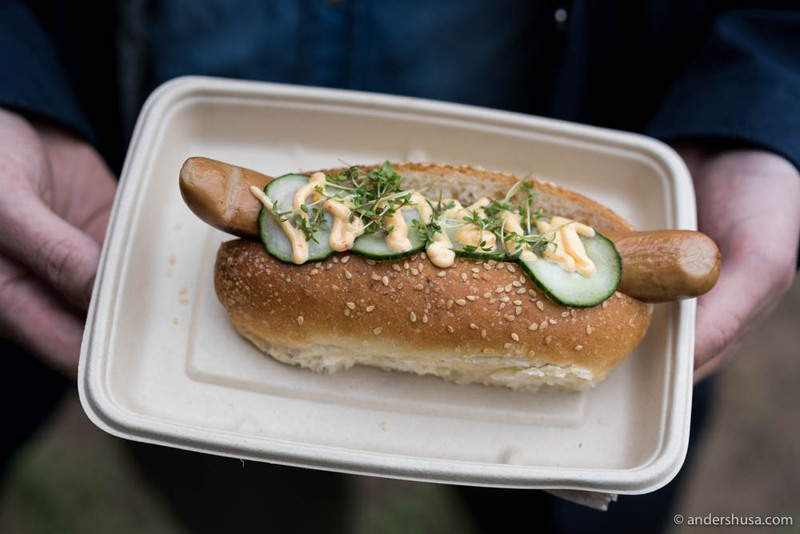 Frankfurter with cucumbers & chili mayo – NOK 85. Each element alone is great, the sausage, the bread, and the chili mayo, but the complete package falls short. The bread is homemade and fluffy, but actually too big for the Frankfurter, which means each bite gets a bit dry. There’s not enough chili mayo to save it either. Get the double sausage option! We tried both! Slightly more interesting flavor to the veggie version, but both had some issues with the dumpling wrapper being too dry and hard on the edges when it’s supposed to be silky smooth and soft. Chicken shawarma – NOK 125. Homemade wrap and good ingredients, but where is the flavor? 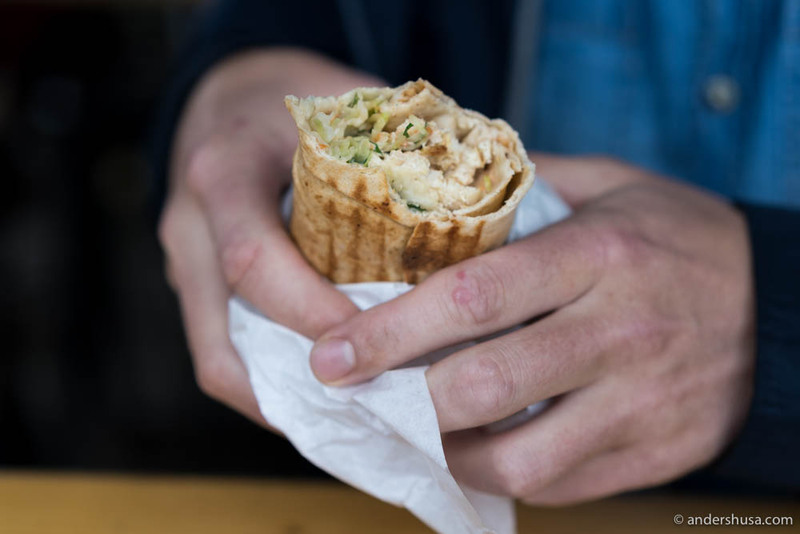 This shawarma is underseasoned, but the presentation makes for a simple festival food item. Just spice it up a bit tomorrow, please? Una Autopizzeria makes wood-fired pizzas in a food truck, parked near the VIP area (but before you enter, so open for everyone) and serves it portafoglio-style. That means it’s wrapped together like they do with street food pizzas in Italy. The Margherita had a perfectly crispy crust, but the flavor of the sauce was weak. We did not get the Italian feeling completely. 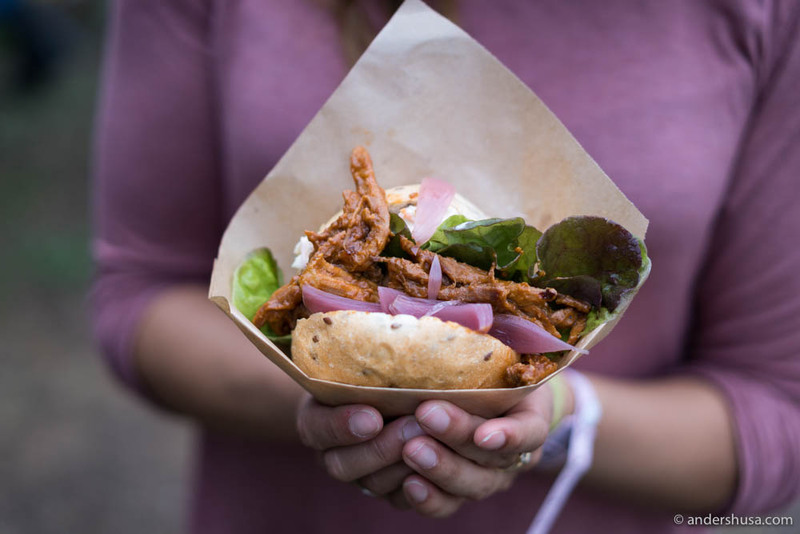 Pulled pork with bread, coleslaw, pickled onions & BBQ sauce – NOK 125. At least, nobody knows their produce better than Gammelgården Lysklæt, who uses pork meat from their own farm. Unfortunately, the sauce tasted more of a sweet tomato ketchup than BBQ, leaving the pulled pork with a bland and boring taste. The bread is not dry, but a bit too dark and heavy. Plus for being festival-friendly. 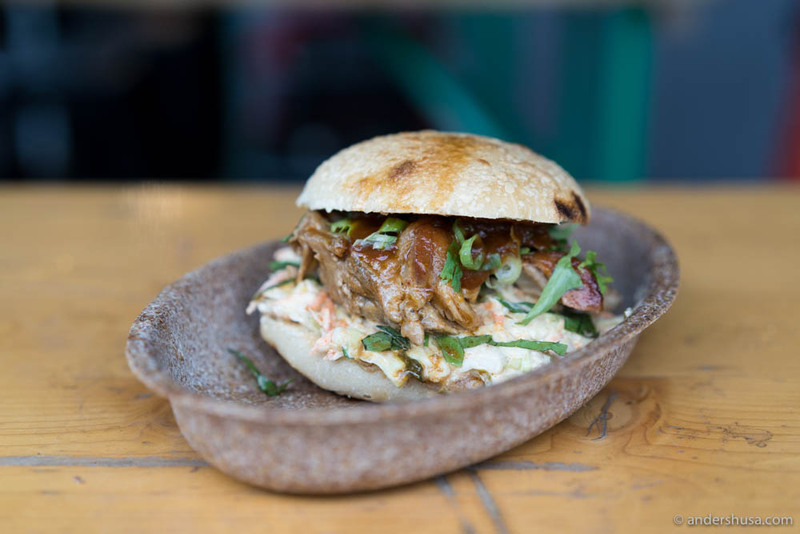 Sandwich chanchito with confit pork rib – NOK 120 – Score: 3/6. 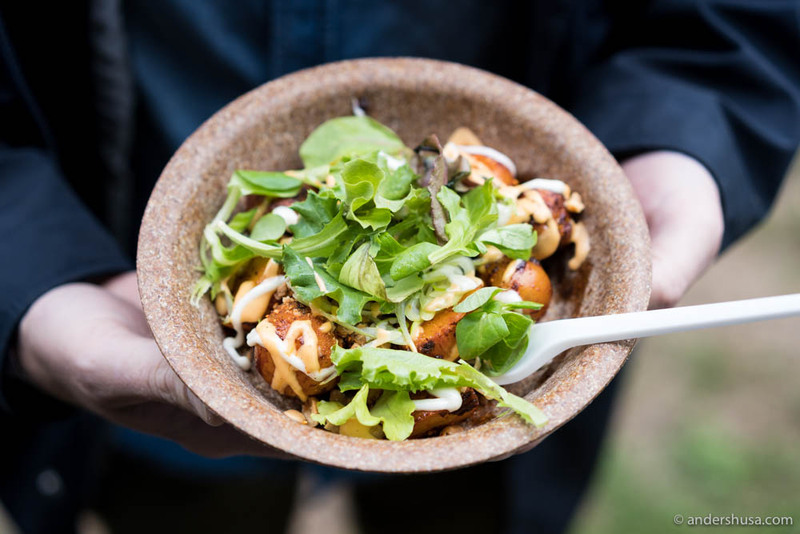 Chili-baked potatoes with rocoto chili sauce, aioli, peanuts, and greens – NOK 90 – Score: 4/6. 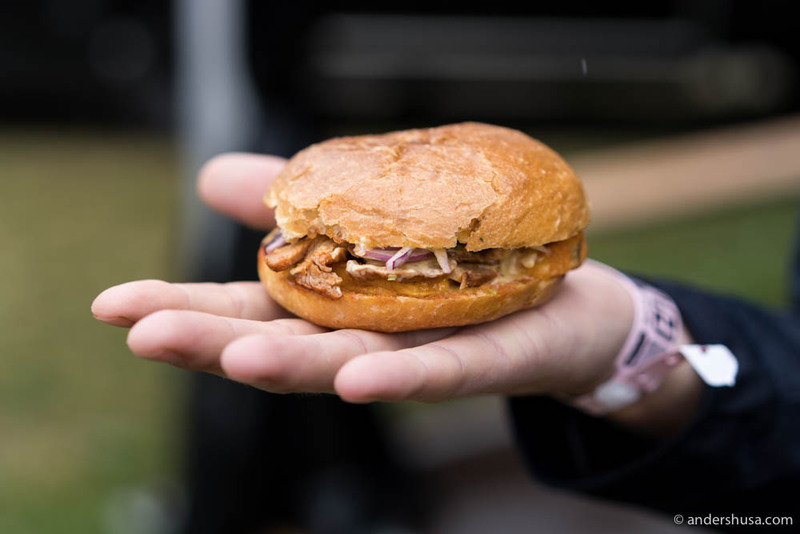 The judges were surprised by the small size of the sandwich (priced at NOK 120), which also fell short in terms of taste. The bread was good, but overall the sandwich was dry and dominated by too much raw onion flavor. Slightly better were the chili-baked potatoes, but after a few bites our mouths dried up again, and we realized the potatoes should have been more crunchy and had more of the sauce and other elements to balance the textures. Vegan handrolls – NOK 65 – Score: 2/6. Aubergine fries – NOK 65 – Score: 5/6. ASIA offers several dishes, and also packages. 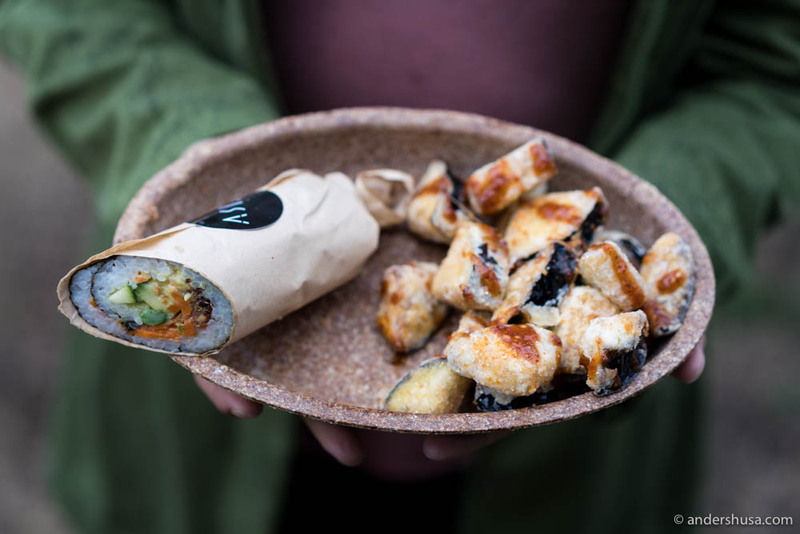 We got the vegan handrolls + aubergine fries (NOK 130), which can also be ordered separately. The vegan handroll tasted of rice and nori, and not much else. However, the aubergine fries were a big surprise. A crunchy outside, combined with a sticky inside, brought forth associations of deep-fried banana – but in a savory twist. The sweet and spicy sauce lifted it another level. Here, the total score doesn’t make much sense, you have to view it dish by dish. 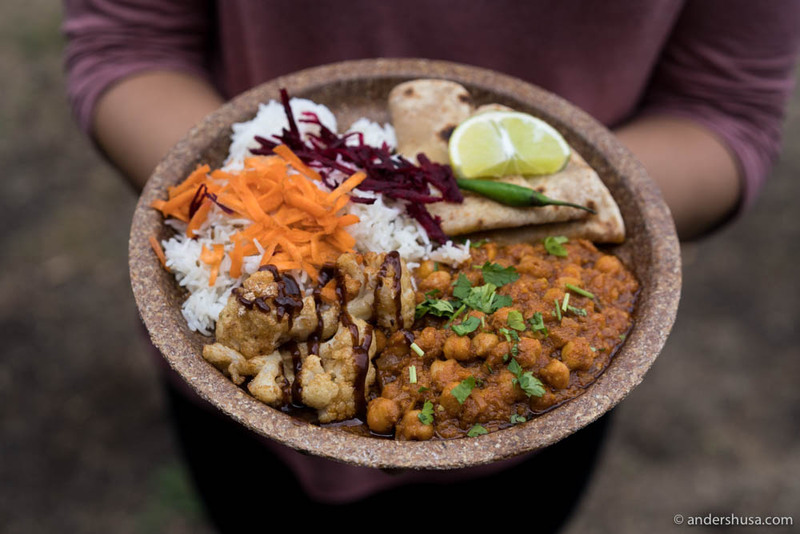 Indian mixed platter with housemade bread – NOK 130. A decent vegetarian-option, perhaps, but overall a rather boring dish. The chickpeas are tasty but very rich in flavor, and the few pieces of pickled cauliflower are not enough to balance that. The judges did not understand why there were shredded, raw, carrots and beets on top of the rice. At least, they should have been pickled. 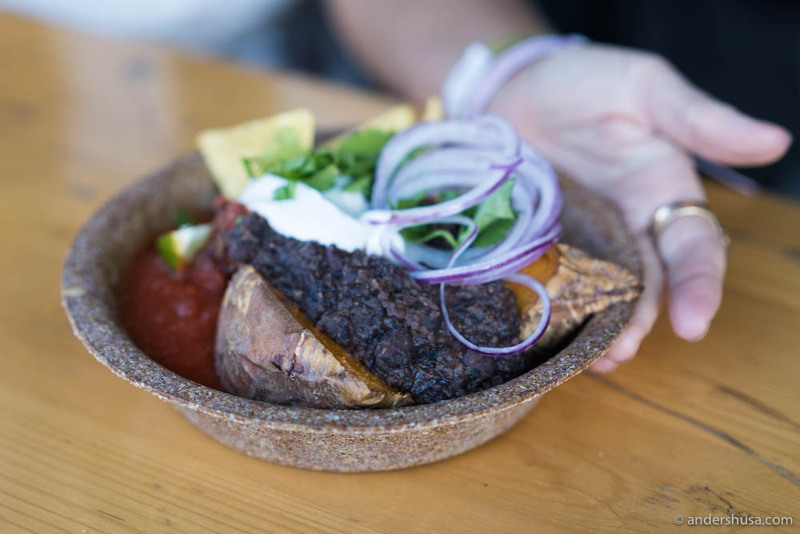 Baked sweet potato with chunky black bean cream and hot tomato salsa – NOK 129. Not so funky, not so fresh food from Funky Fresh Food. To be fair, it actually tastes better than it looks, at least the black bean cream does, and perhaps it’s a decent vegetarian option at a festival. As a dish in a restaurant, I would never order it, though. Taco with oyster mushrooms – NOK 130. 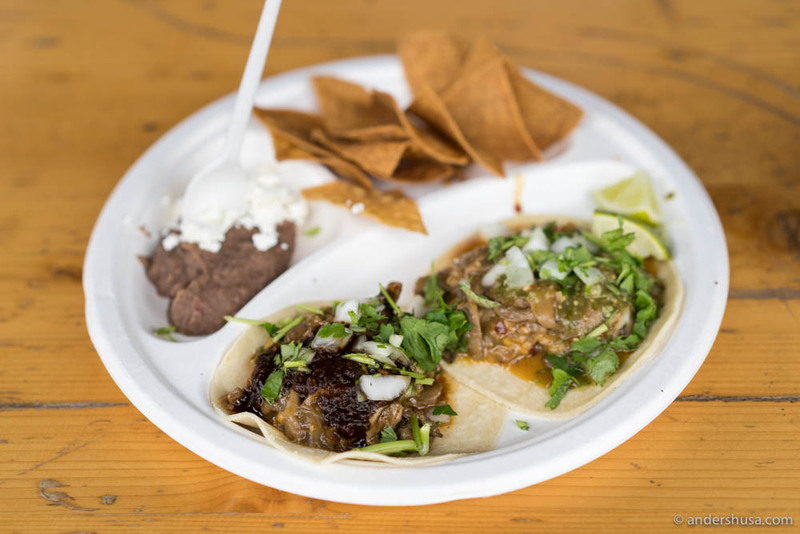 We know Taco República can do better than this! Try the pork and chicken tacos instead of the vegetarian version we had with oyster mushrooms. Bland taste and slimy textures. It also didn’t help that the tortilla chips had been deep-fried on too high of a temperature and tasted burnt and bitter. 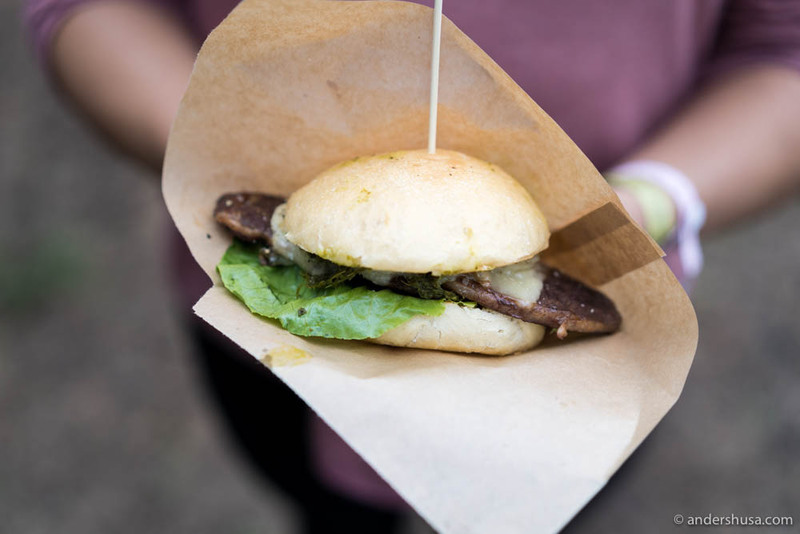 Sandwich steak sandwich, chimichurri, and cheese – NOK 120. Possibly the least appetizing dish we encountered at Øyafestivalen this year. Go’Grilla’s entrecôte in a ciabatta, sadly, didn’t make up for the looks with its taste either. The meat was dry. The bread was dry. Just plain wrong. 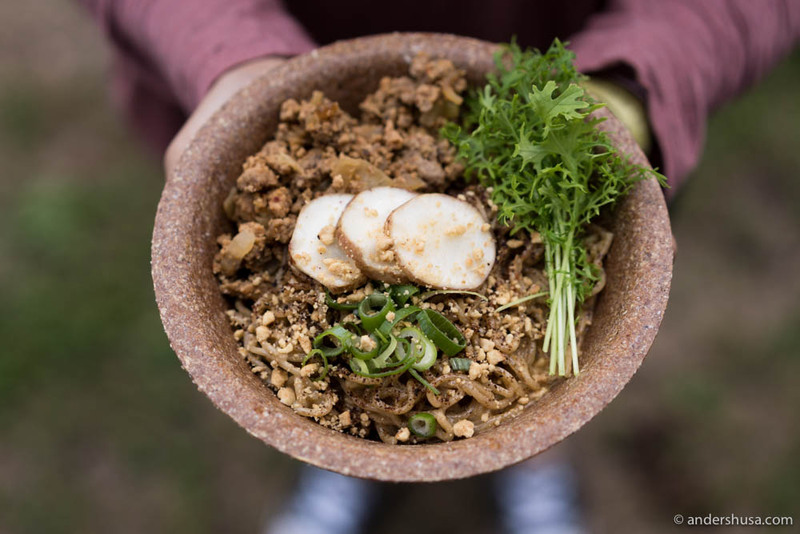 Vietnamese noodle salad – NOK 130. Not festival-friendly, to start with, because it’s difficult to get the noodles out without pushing some of the other ingredients over the edge. Everything is cold, which could have worked, but the chicken was dry and bland. In general, flavors were not exciting, although the vegetables were crispy and fresh. Classic falafel platter – NOK 130. 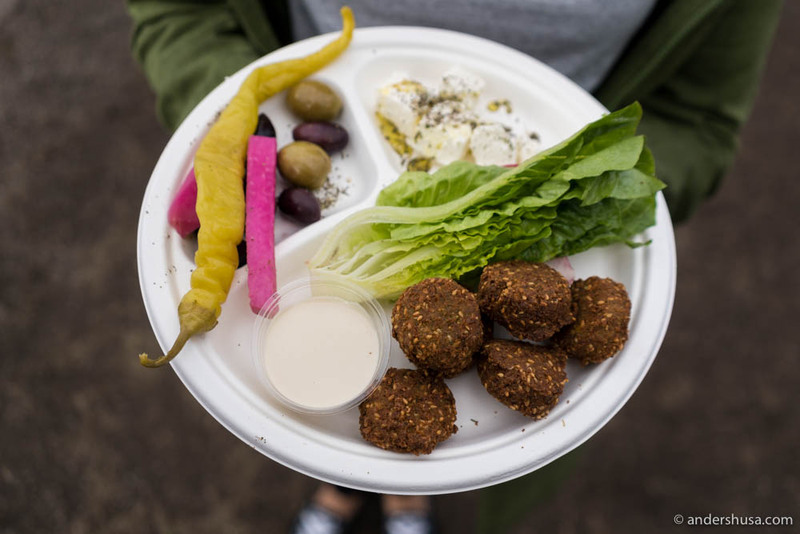 Hopefully, this plate of festival falafel is not representative of the soon-to-open restaurant Ben Reddik in Oslo. This was just zero effort on a platter. Tasteless falafel balls with even more tasteless dip. Some random pickles and olives and some feta cheese. Half a little gem salad, that wasn’t even washed properly (we double-checked at two different time slots, and got dirty lettuce both times). 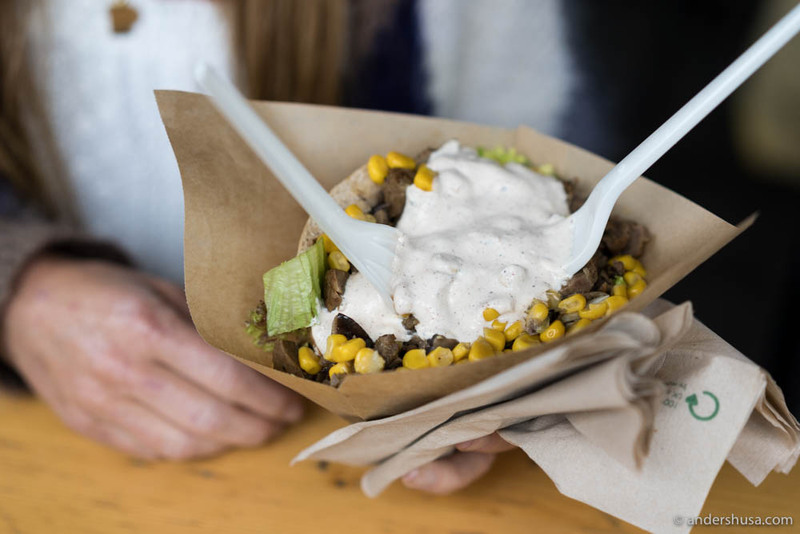 Elkbab – Kebab with elk, shiitake mushroom, lettuce, corn, and lingonberry-sour cream – NOK 130. The worst dish at the festival is the elkbab – a kebab of elk meat with both bad taste and texture. In an attempt to make it Norwegian, there’s a lingonberry-sour cream, but, sadly, it tastes of nothing, and what does it matter when you also fill it with corn and iceberg lettuce? Stay clear. What was your favorite festival bite? Please share in a comment below. I’m an official partner of Øyafestivalen this year. Nice review! To day i recommend you to try a delicious alkoholfree Mocktail/drink at Leske.no. Perfect to all this good food and for the music? Enjoy!